It is a classic love story with a twist. Kim and Scott Holstein met at a Richard Bach book signing in 1994. Kim was obsessed with pretzels. Scott was obsessed with Kim. The following year, they launched a gourmet pretzel empire out of their Lincoln Park studio apartment. 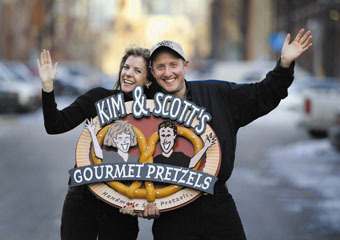 Kim and Scott have since upgraded to a 25,000 square-foot factory west of the Loop and added three kids to the mix, but the key ingredients haven’t changed – a passion for pretzels and for each other. If you are in the mood for a handmade pretzel stuffed with spinach and feta or with chocolate, visit Kim and Scott’s Twisting Café at the Kohl Children’s Museum, tune into QVC, check out their website, or stop by coffee shops and grocery stores across the country. Through Pretzels for Peace and other creative philanthropic initiatives, Kim and Scott plant trees, feed the hungry, empower kids and fight breast cancer. So, whether you crave omelet pretzels in the morning, think poodles and golden retrievers should mate more often, or pray at the greenest synagogue in town, Kim and Scott Holstein are Jews You Should Know. Kim: So much! I’m crazy about pretzels and coming up with new flavors and products. I’m passionate about children’s health and developing healthy grab and go products for kids. Having three kids of our own and a café inside a children’s museum is a demonstration of how our lives and passions are twisted together – like a pretzel. Kim: I love to read lots of books at once. Right now, I’m reading The Answer is Simple by Sonia Choquette, one of my favorite writers and mentors. I’m also reading Meatball Sundae by Seth Godin, a book about marketing and its transformation in the age of the internet, and Ellen Tebbits by Beverly Cleary for a book group I am in with my 8-year-old daughter, Sonia. Scott: The Omnivore’s Dilemma by Michael Pollan and Marley and Me by John Grogan. We have a new golden doodle. Kim: I have to honestly say that I’m a huge fan of our Twisting Café at the Kohl Children’s Museum. With a healthy menu of pretzel sandwiches and salads, I can’t get enough of it. I also love Blind Faith Café in Evanston. Their vegan chocolate cake is the ultimate! 5. If money and logistics played no part, what would you invent? Kim: A single ingredient that cures cancer, grows more wheat to feed the hungry (and has ultra-powerful vitamins for nutrition), and ironically can also be diluted and used as a fuel alternative. Kim: Invisible. You can always fly in a plane, but to be invisible could be a valuable ability. 7. If I scrolled through your iPod what guilty pleasure would I find? Kim: I love meditation and songs for yoga, peace, relaxation and reflection, so you’d find a ton of these kinds of songs and guided meditations. I also have my classic favorite songs from Peter Gabriel, Elton John and 10,000 Maniacs. Scott: Last season's 30 Rock -- the best sitcom! 8. What’s your favorite Jewish thing to do in Chicago? In other words, how do you Jew? Kim: We belong to Jewish Reconstructionist Congregation in Evanston. 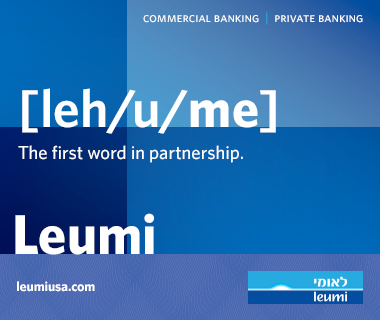 It’s an incredible community, filled with activities and services that are meaningful and spiritual--a place where we feel connected to Judaism at many levels. For the past two years we have gone on the synagogue family retreat and had a blast together. Also, we enjoy Shabbat every Friday night and Jewish holidays, whether it’s with other families, or just our gang.